Camp Santanoni Partners win OPRHP award, Unit Management Plan accepted and summer volunteer opportunities. A decade of progress, main camp conservation, birch bark replacement, a new Visitor’s Guide, and the Farm Manager’s cottage mystery solved! 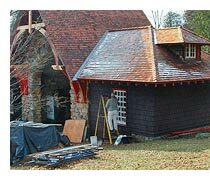 Boathouse restoration, Michael Frenette, builder & craftsman, major works at Gate Lodge & West Cottage, Delano & Aldrich rendering of Gate Lodge – reproductions available. During summers, several restoration and conservation projects will be completed at Camp Santanoni. Please enjoy watching the progress of this work but do keep a distance from the construction areas. 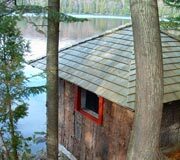 Thanks to continued support from the New York State Department of Environmental Conservation, the Town of Newcomb, and the Friends of Camp Santanoni, work will continue at the Main Camp to complete the restoration of the boathouse on Newcomb Lake and on other Main Camp outbuildings. 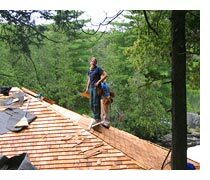 The contractor is Michael Frenette from Tupper Lake. The project has also received support form a $92,000 grant to AARCH from New York State’s Environmental Protection Fund. The Boathouse was among the most seriously deteriorated of all Santanoni’s remaining buildings. In the past ten years, most of the roof had collapsed, the floor system had completely deteriorated, and many of the building’s log walls had begun to rot. Over the past three summers, the crew reinstalled stone foundation blocks, built an entirely new floor and sill system, conserved existing logs, and installed new logs, as needed. They also reframed the roof, surfaced it with new cedar shingles, and installed several drainage trenches in and around the building to allow for proper drainage. To accomplish all this, the existing log walls had to be stabilized and the whole building was raised, in order to replace the deteriorated components of the building underneath. This summer, the windows and doors will be restored and reinstalled and the building will be restained and otherwise made ready for use again by the public. Work has also been done on the Generator House, Gazebo, Ash House, and Pump House. The Generator House now has a new roof and door and its windows have been restored and painted. The Gazebo has a new floor and foundation. The Pump House has new roof and the Ash House work was completed by reinstalling its original door. 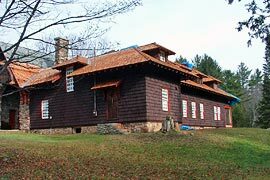 Thanks to a $365,000 grant to AARCH from the federal Save America’s Treasures program and additional support from NYSDEC and the Town, Mercer Construction will complete substantial exterior conservation work at the Gate Lodge and West Cottage in June. The project architect is Argus Architecture & Preservation from Troy. 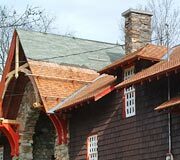 The project has addressed most of the structural and exterior conservation issues at the Gate Lodge and West Cottage, including: repair and replacement of shingles and trim, an entirely new cedar shingle roof, painting and staining, and extensive foundation and masonry repairs. Substantial restoration and conservation of the Farm Manager’s Cottage and the correction of internal structural problems at the Herdsman’s Cottage at the Farm. Structural repairs and exterior conservation of the kitchen/staff wing at the Main Lodge. Restoration of the deteriorated stone culvert that carries the Newcomb Lake Road to the Main Camp. Improved fire detection and protection. All of this would not be possible with the support of all of you who love this special place. Over the summer we will have three staff people at the camp. In addition to interpreting the site to several thousand visitors, they will undertake small restoration projects, oversee volunteers, and do other special projects at the site. For information on working at Camp Santanoni as a summer staff person, please visit our most recent internship/staff posting. On July 13, a fire of suspicious origin destroyed Camp Santanoni’s Barn, one of the most visible and significant buildings at the camp. In many ways, for all of the Santanoni partners, it was our worst nightmare come true. Santanoni’s buildings are predominantly wood, highly flammable, and there is currently no fire detection or protection equipment on site. 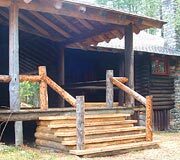 There is also little regular oversight and the remoteness of most of the camp make saving a building nearly impossible by conventional means. Since this devastating loss and after a long internal discussion, Adirondack Architectural Heritage (AARCH) has been urging the state to use the fire as a wake-up call to reaffirm its commitment to Santanoni and provide the resources needed for effective fire protection, conservation of all the buildings, and proper staffing. AARCH has also taken the position that the barn should be reconstructed. The barn was the anchor structure of the Santanoni farm and the size and sophistication of the farm is one of the camp’s most unique features. “Without the barn and without the open fields that once surrounded the farm, the remaining buildings are but cottages in the woods. The barn is essential to understanding why this is an important site and why it is a National Historic Landmark” said Steven Engelhart, AARCH’s executive director. Adding to the tragedy is the fact that New York State “self-insures” its buildings and rebuilds them only when it sees fit. In this case, the state has not yet taken a position on rebuilding the structure. Another critical need at Santanoni is for better overall site supervision and management. “A full-time, professional site manager is needed for a historic property of this scope and importance,” stated Howie Kirschenbaum, AARCH’s founding board president and co-author of Santanoni. “The Town of Newcomb and AARCH will continue to provide summer interpreters and volunteers, but this is a state-owned property, and the state needs to have a line in the Department of Environmental Conservation’s annual budget to insure adequate staffing and conservation efforts there.” Currently, one DEC person, Clive Friend, oversees Santanoni but his responsibilities extend over a huge territory well beyond the camp. This program is a project of the National Park Service and the National Trust for Historic Preservation and is dedicated to the preservation and celebration of America’s priceless historic legacy. Meeting our commitment of $25,000 in matching funds for the Save America’s Treasures funded work. Meeting our goal of raising $50,000 in matching funds for future conservation projects.